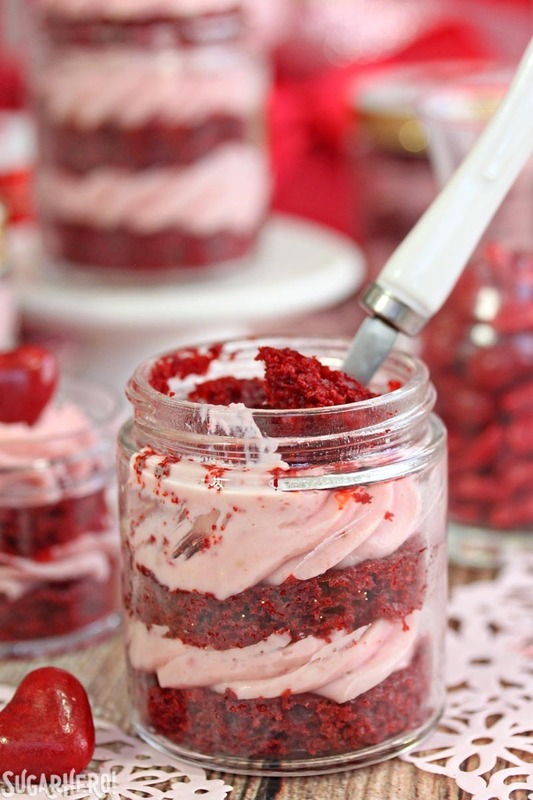 Red Velvet Cake In A Jar is a whole new way to enjoy red velvet cake! Made with strawberry cream cheese frosting, these mini desserts are portable, giftable, and adorable! Valentine’s Day gift-giving is usually “diamonds” this and “bouquet of red roses” that. Which is all well and good, if you live in a romantic comedy, but those of us in the real world probably don’t have the coin—or the desire—to gift our nearest and dearest with honkin’ gemstones or the world’s most overpriced flowers. But who needs those cliches anyway? This Valentine’s Day, I think we should bake our way into their hearts. After all, as the saying goes, cake is a girl’s best friend. 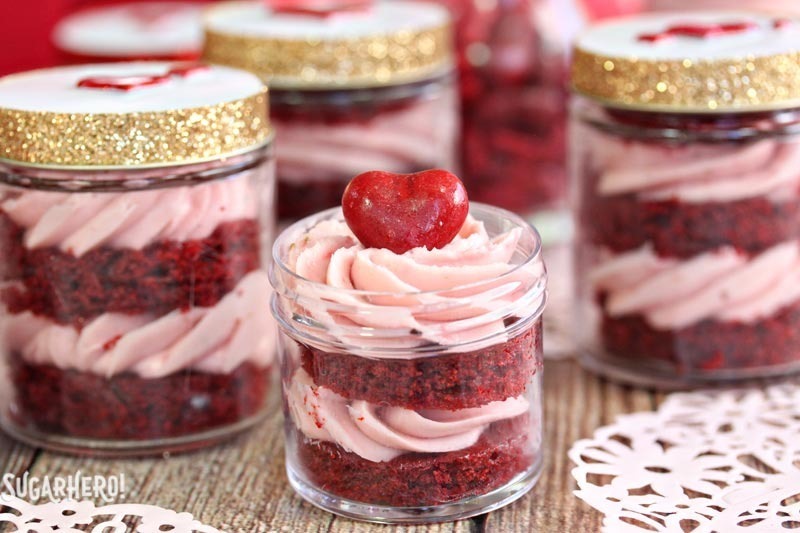 I’ll be gifting these mini Red Velvet Cake Jars this Valentine’s Day, and not to toot my own horn, but they’re basically the perfect gift for anyone. They’re red and pink, which makes them adorably holiday themed and appropriate for loved ones. The only people they’re not good for are the folks who don’t eat dessert, but when you think about it, are sugar-shunners really a good influence in your life? Choose your friends wisely, is all I’m saying. Why Serve Cake in a Jar? No doubt, making a sheet cake is easier than assembling small jars of cake and frosting. So why go to the trouble? 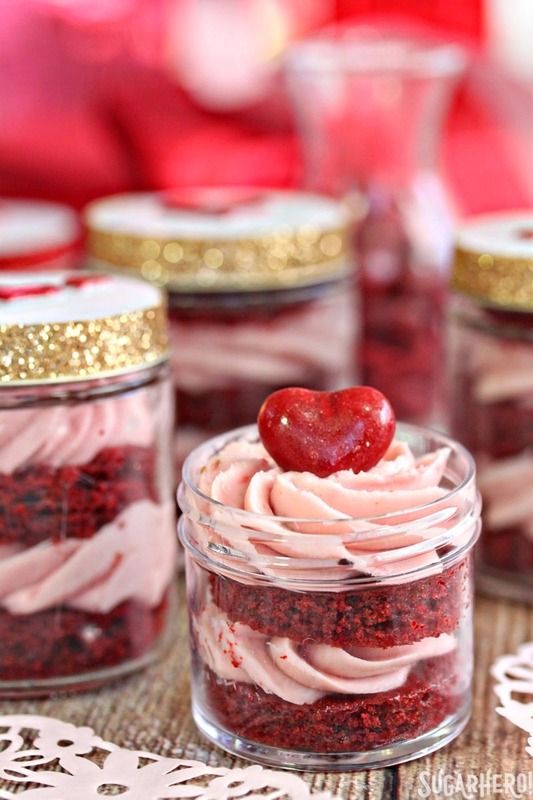 Cake in a jar is portable, giftable, and adorable. Yes, we hit the dessert trifecta with this one! It makes a great gift, you can take it anywhere (picnics, anyone? ), and is there really anything cuter than miniature desserts? I’ve seen lots of other cake-in-a-jar recipes, but many of them involve baking the cake in glass jars, then putting frosting on top. 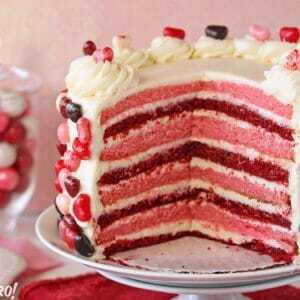 This concept of layering cut slices of cake and frosting was so much more appealing to me, because you can control how much cake (and how much frosting, om nom nom!) you put in the jar. For frosting-lovers like myself, cake in a jar is basically the best invention since sliced bread. Wait, never mind, cake in a jar is WAY BETTER than boring sliced bread. It’s equal parts cake and frosting, which in my mind is the ideal ratio. I wanted to make these jars a little extra special, so instead of regular cream cheese frosting, I made strawberry rose cream cheese frosting. It’s fruity, with a delicate floral flavor that is so delicious with the tangy cream cheese. Let’s talk supplies! I got my jars at The Container Store (love that place! ), but there are lots of options on Amazon as well, and I’ve linked one example below. You can also use decorative cups or ramekins if you won’t be transporting them and don’t need a lid. I experimented with making two different sizes: 2-ounce jars and 4-ounce jars. I expected I’d like the bigger size better (because bigger is always better, right?) but I surprised myself by preferring the smaller size. The little 2-ounce jars are the perfect single serving for quenching that sweet tooth! If you do 4-ounce jars you can get about 12 jars from the recipe, but if you do the smaller jars you can get about 20, which means more for gifting, and more for eating yourself! For the pictures, I filled some of the jars up past the top, but of course for gifting you’ll want to give yourself some space to screw the lid on top. 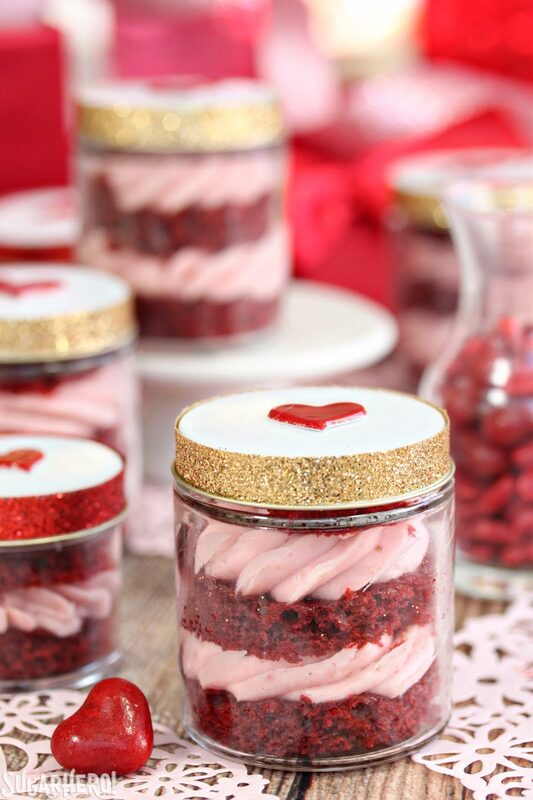 The jars can be topped with heart candies, gummies, or just Valentine’s sprinkles! 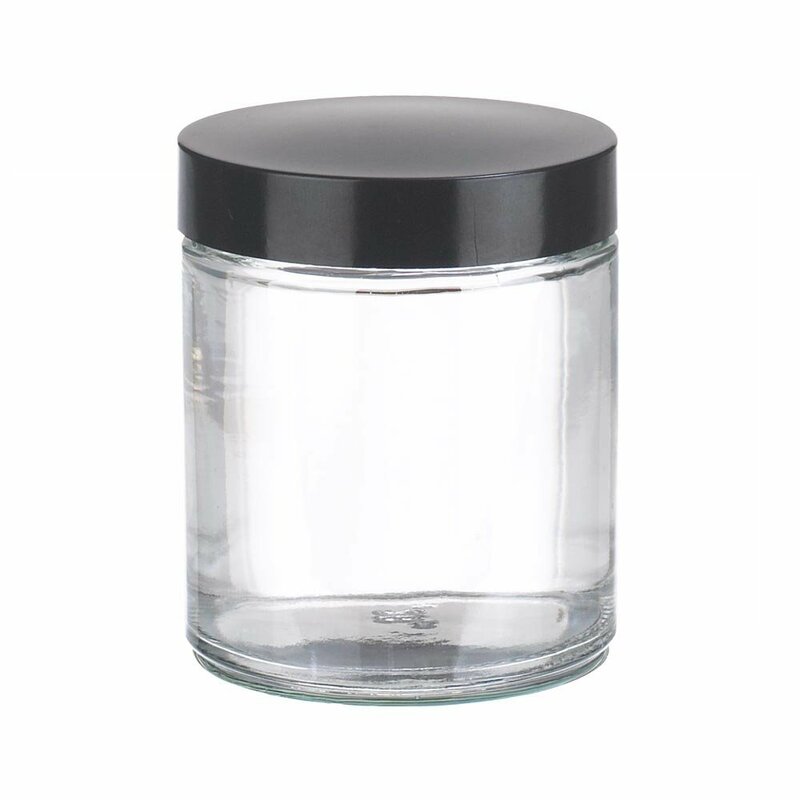 Unlike cupcakes or even cake slices, cake in a jar doesn’t go stale very quickly, thanks to all that frosting between the cake layers and the jar’s airtight lid. So this is a GREAT choice for a make-ahead dessert. My guess is that they can last at least a week, probably closer to 2, in the refrigerator, but to be honest, ours didn’t last that long. Enjoy! 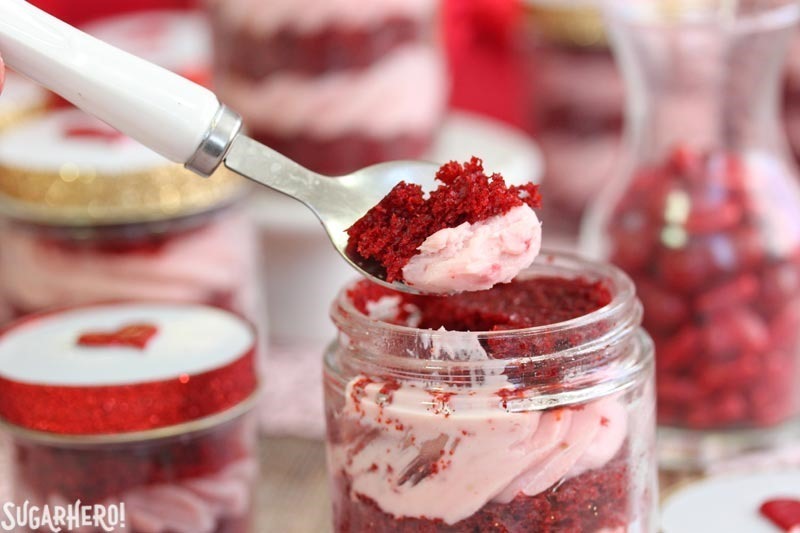 Red Velvet Cake In A Jar feature layers of red velvet cake and strawberry rose cream cheese frosting in miniature jars. They're perfect for gift giving! You can make these in any size jars, but I recommend keeping them on the smaller side and making them in either 2- or 4-ounce jars. If you make 2-oz jars you'll get about 20 servings, and if you make them in 4-oz jars you'll get about 12. Preheat the oven to 350 F. Line an 11x17-inch rimmed baking sheet with foil, extending up and over the sides of the sheet. Spray the foil with nonstick cooking spray. 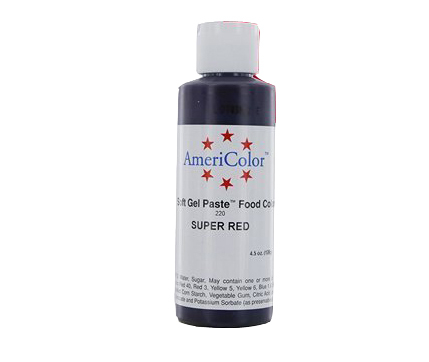 In the bowl of a large stand mixer fitted with a paddle attachment, combine the vegetable oil, buttermilk, egg, red gel food coloring, vinegar, and vanilla extract. Mix on medium-low speed until well-combined. Pour the cake batter into the sheet pan and spread it into an even layer. (It will be a very thin layer of cake.) Bake the cake at 350 F for 10 minutes, until it pulls away from the sides and springs back when lightly pressed with your fingertips. Cool completely before using. The cake can be baked several days in advance. If making in advance, wrap the cooled cake in cling wrap and freeze until ready to use. You do not need to defrost the cake before assembling the jars. Place the freeze-dried strawberries in the bowl of a food processor and process until they are ground into a powder. Combine the cream cheese and butter in the bowl of a stand mixer fitted with a paddle attachment. Beat them together on medium speed until light and fluffy and free of lumps. Add the powdered sugar, strawberry powder, rose water, and salt to the bowl, and beat on low speed until combined. Scrape down the bottom and sides of the bowl, then beat on medium speed until light and fluffy. Taste the frosting, and add additional sugar to taste. If the frosting seems too stiff, add a spoonful of milk or cream until it reaches your desired texture. The frosting can be made in advance and kept in an airtight container in the refrigerator for up to a week. When you're ready to use it, let it sit at room temperature for at least 20 minutes before piping it into the jars. You can also re-whip it in the mixer to loosen it up a bit if it is too stiff to pipe after being refrigerated. Place a circle of cake in the bottom of a jar, and top it with a swirl of frosting. Keep layering cake and frosting until you reach the top of the jar. Once you put the lid on the jar, you can decorate them with ribbons, stickers, gift tags, or anything else you can dream up! Continue until all of the jars are assembled. 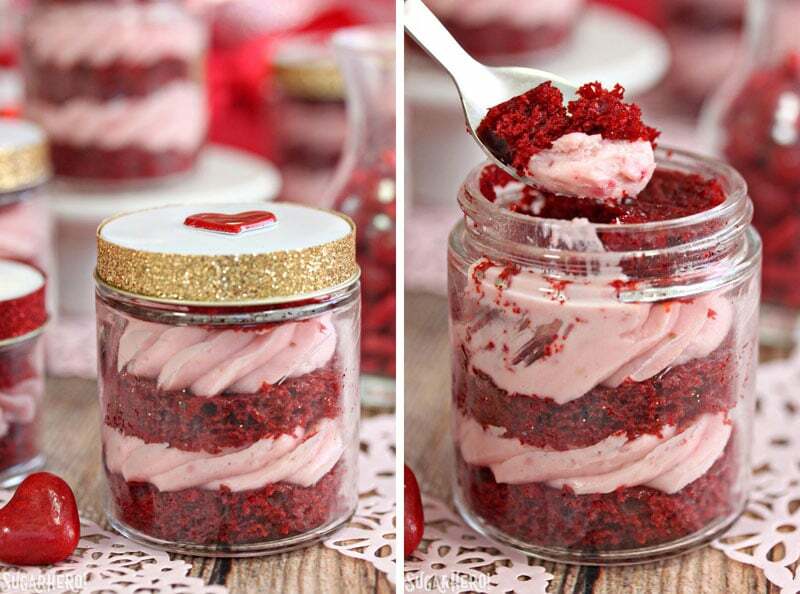 Red Velvet Cake in a Jar can be stored in the refrigerator for up to a week, and for the best taste and texture, can be brought to room temperature for about 20 minutes before serving. These are gorgeous Elizabeth! 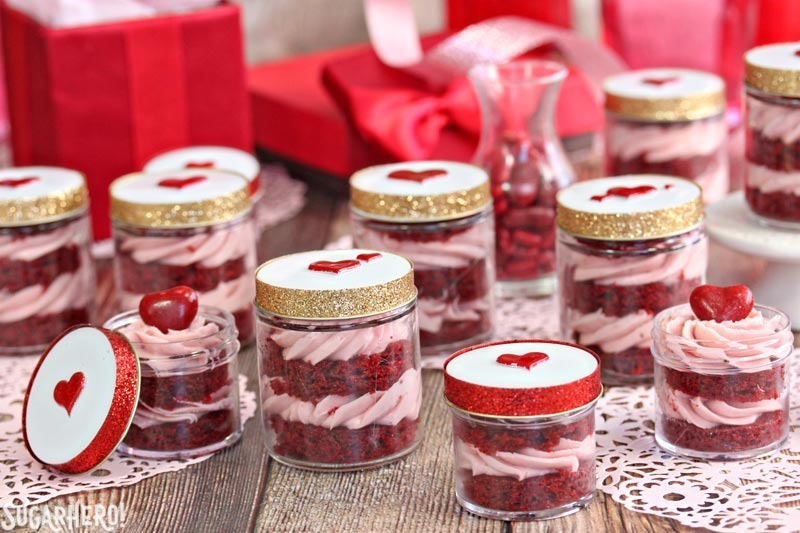 I love anything red velvet but those jars – they are almost too pretty to eat! Pinned! 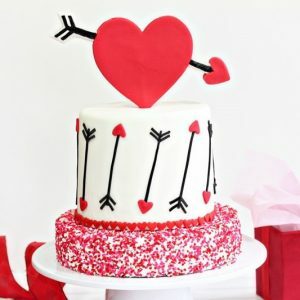 I’m so glad you liked Cakelove! They’re my favorite of all of our cupcake bakeries in DC (yes, I like them even better than Georgetown Cupcakes and Sticky Fingers). 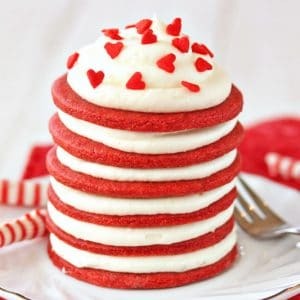 The cream cheese icing that they put on their red velvet cakes is to DIE for–i’ve had one every year for my birthday like 5 years running, lol. Thanks, Kirstyn! I am definitely going to have to try some more CakeLove flavors once I get back to DC–and you’re right, the cream cheese frosting is incredible! I hope you enjoy the cake jars, and shoot me an email if you have any question. If you’re not into the strawberry/rose cream cheese flavor combo, you can leave out those components and still make a darn good cream cheese frosting. 🙂 Send pics of the finished jars! Hello. Great blog. I was curious as to where you purchased the freeze dried strawberries? Your creations are always gorgeous! 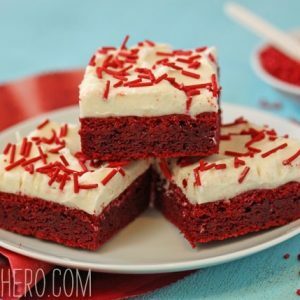 These red velvet cakes are no exception. I’m afraid if I made them, I wouldn’t want to give them away! Have a terrific Valentine’s Day! Haha, I have the same problem sometime! The trick is to make so many that I don’t miss a few. 🙂 Thanks Liz, happy V-day to you as well! What a cute gift idea! And I like the freeze-dried strawberries in the frosting so you get the color and flavor without thinning it out. Thanks for sharing! Thanks Annemarie! I am super obsessed with freeze-dried fruit and use them in pretty much everything. I should buy stock or something! Awww, thank you Eleanore! Happy (belated) Valentine’s Day to you! I love the way these look–so delicious! Oh my goodness, I’m mad that Valentine’s Day is gone because I’d love to make these! Do you think they’d work for Easter? Definitely! You could do some pretty pastel colors and top them with a few candy eggs–that would be so lovely! Love this idea. So anxious to make them for Easter. I don’t want to make them Red Velvet though. How should I alter the the cake recipe? I would prefer a white or yellow cake. 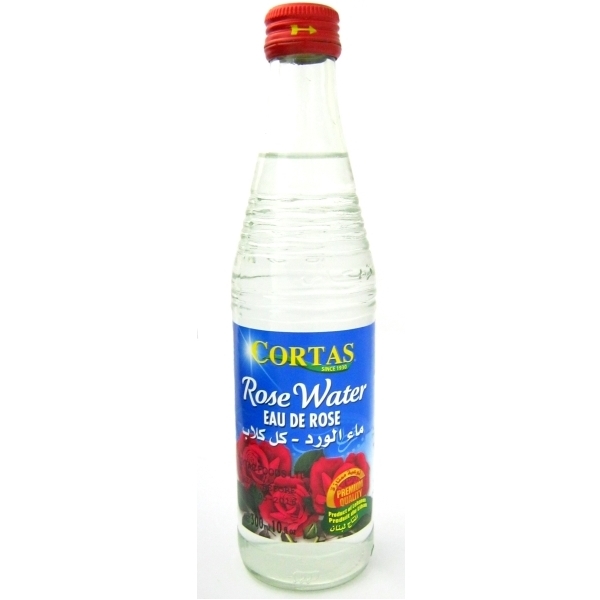 Hi Rose, The larger jars are glass, the smaller ones are plastic. Both seem pretty sturdy. 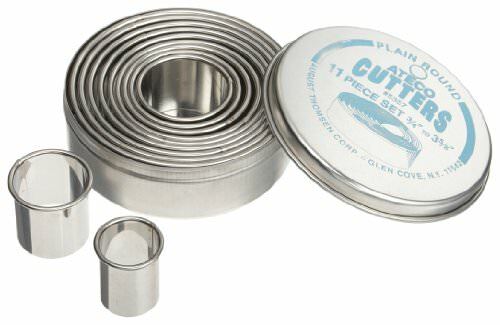 The ones I linked to from Amazon are the larger size (4 oz) and are glass as well. If you have a favorite white or yellow cake recipe (or if you want to use a cake mix) you can just use that instead. If you want to use this recipe, you would omit the food coloring and cocoa powder, and I would suggest upping the vanilla to give it more flavor. It will basically be a buttermilk cake at that point. This just answered a question I had just now submitted…. thank you. I am so excited to try these for our club members. I think that sounds adorable, Mary! I bake often and decided to try these for Valentine’s Day. . They turned out cute but I have to say not that flavorful. Frosting is ok but cake not so good. Will look for something else next year. Hey Pam, I am sorry to hear that! If you ever want to troubleshoot and see if there is something we could do don’t hesitate to email me. Thank you for your feedback! How do you get the cake into perfect little circles? Would this work using a boxed cake mix? This is a great idea, I need something to do for a meeting close to Easter. I wondered about using a white or yellow boxed cake mix and adding some food coloring.